Confession: nothing I read this month knocked my socks off as much as The Quartet did last month. It's not that I read anything bad (although The Dead Tracks by Tim Weaver came close); just that I didn't read anything spectacular. 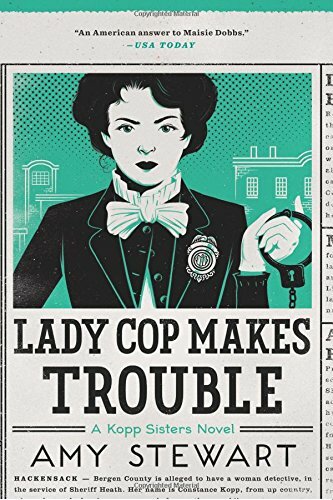 My favorite read, though, was Lady Cop Makes Trouble by Amy Stewart. Lady Cop is historical fiction, the second in a series about Constance Kopp, the first female deputy sheriff in New Jersey. I adored the first book in the series--Girl Waits With Gun. It touched on serious issues, but with a light touch and a sense of humor. There was something almost "Keystone Cops" about it. I had high hopes for the sequel. In some ways, Lady Cop was as good as Girl. The characters of Constance and the sheriff, for example, were satisfying. They grew with the story. The mystery was well-plotted with appropriate twists and turns. The supporting cast--the minor characters--added color to the story and depth to the story's world. The characters of Constance's sisters were not as satisfying. Norma and Fleurette were fun in the first book, but by the end of this one, they grated and annoyed. Each sister is unique and colorful. However, they stayed in their lanes, rigidly. They reminded me very much of George and Bess in the old Nancy Drew books. The tomboy and the girly-girl, the same in every book, the same strengths, the same flaws, no growth as people or characters. Constance's sisters felt just like that. While their lives in this book had broadened since Book 1, it didn't seem like they'd changed as a result of those wider experiences. And while Lady Cop had the same light touch as Girl, it lacked the "Keystone Cops" humor of its prequel. I missed that. That said, I do enjoy this series, and I will read the next one. This book might be the "sophomore slump," but it was still an enjoyable read. Note: Clicking on the book cover will take you to the book's Amazon page.